Taking their name from Gerry Anderson’s puppetry technique, Supermarionation are a three-piece band from Edinburgh. Their debut EP ‘On The Fly’ features five tracks, capturing the range of styles (usually bouncy and punkish or fairly broody) within the band’s musical cannon. The opening number, ‘Those Home Girls’ features a fantastic bassline which sprawls out under busy drumming and occasionally brilliant guitar leads. Vocalist Steve spits lyrics with vigour, though his slightly flat tone and mushy DIY production make them hard to decipher at times. ‘The Ashes of Love’ takes a similar energy and delivers it in a straight up fuzzy rock fashion; the infectious, slightly distorted guitar lead being the driving force throughout. It’s at this kind of upbeat material Supermarionation excel; their liveliness and relative naivety lends enough charm to carry things off. It’s the EP’s shining star, sounding like stoner legends Fu Manchu tackling the chorus riff from Gillan’s ‘Running White Face, City Boy’. There’s not much of a refrain, but the riff is chunky enough win you over. ‘The Rising Tide’ is much slower, with a sneering edge which is reminiscent of Therapy? at their slowest. Drummer Dave occasionally lapses into a quirky pattern which sounds not unlike Fyfe Ewing, albeit without the hard snare work. Sadly, vocalist Steve’s slightly flat style lacks the required anger, but even so, the end result is pleasing enough. Sprawling out over five minutes, ‘Lonesome Symphony’ recycles a few sixties inspired riffs and delivers them in a fairly uninspired way. The main riff sounds like one which should have been great, but struggles to keep things interesting. A few key changes do little to keep up momentum, but on the plus side, Dave’s solid drum style holds things together nicely. Had this been delivered much louder, fuzzier and heavier – a la Orange Goblin or Kyuss – Supermarionation may have had enough balls to make it work. While there’s a mood here which hints at the Kyuss number ‘Gloria Lewis’, it severely lacks the power it really deserved, being delivered instead with a rather lightweight sound. ‘Nothing Means Nothing’ finishes the EP with another much needed burst of garage rock. Dave’s drumming bristles with energy, propelling the groove forward at a mighty pace, helped no end by his hi-hat technique. Against the drums, the guitars bring a mid 90s indie punk quality, over which Steve’s vocals yell – though as before, never in the most appealing way. 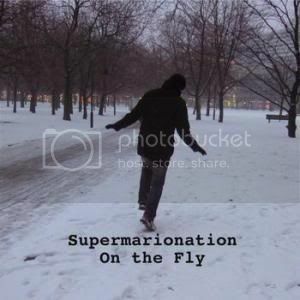 Musically, this is certainly the best track ‘On The Fly’ has to offer, capturing Supermarionation in a mood which recalls the sound of the shortlived 90’s non-phenomenon, The New Wave of New Wave. If, for whatever reason, you’re of an age whereby you find yourself looking back at the likes of These Animal Men or S*M*A*S*H with rose-tinted glasses, then this could be for you. There are times throughout ‘On The Fly’ where Steve’s vocal style could be seen as hampering the band’s overall sound, but in contrast, some of his retro lead guitar work adds a bit of sparkle. Generally speaking, on this debut, Supermarionation have some great ideas, but their song writing needs a little tightening up. Thanks for the review, glad to know someone is listening. No worries Steve. Although I found your EP a little hit ‘n’ miss, there were some great ideas in there. Looking forward to hearing you guys expand on those next time around.